Writing is more or less what I studied in college——mainly non-fiction——and what I really love to do. But actually writing? There’s a lot of fear that comes along with that. There’s the invitation for constant rejection and judgment, the small or nonexistent paychecks, the uncertain future, the inherent narcissism of feeling that anybody should care at all about the words you manage to string together. I’ve become far less shy (thanks, in large part, to this blog) about letting people read things that I write, but despite the encouragement of many professors, friends, family, and readers here on this site over the years, I’ve been a real shithead about actively trying to do anything with my writing. I seem to operate on the idea that someday I’ll get around to it, but not today. I feel like I spend a lot of my life these days hustling from one thing to the next and just trying to stay afloat and make it all work, and as a consequence I tend to worry a lot about whether I’m losing sight of my actual goals. I worry that I have no real idea about how one goes from Point A to Point B, and that my life doesn’t reasonably allow for the possibility of figuring it out. I suppose these are pretty common feelings for 20-somethings (or everybody, really) to feel, but still. I can’t escape the constant nagging that I’m doing everything wrong and backwards. I want to change that. I want to write stuff. So I wrote a thing: the “personal history” essay segment for Anthology Magazine‘s Winter issue. And it felt really good. Working with Anh-Minh Le, the editor, was so great—she gave me loads of creative freedom and feedback and then patiently allowed me to be annoying and picky about details and editing as I reworked and tried to whittle it down to an acceptable length. It was stressful and hard and scary, but I’m happy with my work. It’s just 3 little pages——nothing crazy——but I learned so much in the process. And now, here it is! Something I wrote, printed in a really pretty magazine, on really nice paper, with illustrations! Anthology is a really beautifully produced publication, and this issue——also featuring my cyber-friends Lisa and Clay, the multi-talented Fabulous Beekman Boys, and lots of other great folks——is no exception. It’s packed full of inspiration and beautiful pictures and good writing and interesting stories, and there I am, wedged into pages 43-45. It’s so cool to be a part of it. So if you ever wondered what happened to the previous owner of our house or whether our house is haunted or why the Internet is a crazy place or how I feel about it all, I’d appreciate if you’d pick up a copy! Here is a list of stockists who might have the current issue if you’d like to buy it in person, and it’s also carried at Anthropologie stores nationwide and online. Huge thanks to the team at Anthology for taking the leap on me and to the very talented Christine Rösch for the fabulous illustrations of my piece! I’d be hugely pleased if you read it. P.S.—the Hygge & West giveaway is still open and accepting entries, so if you haven’t thrown your name in the hat for some beautiful wallpaper, get to it! I remember those feelings from my 20’s but I would never have been able to describe them (you do good and the stringing together of words :). Good on you for doing the scary. So true Gillianne! Imagine you write a book Daniel and Anna design the cover!!! Thanks, Gillianne! I’m definitely aware and cognizant of the things I *am* doing and proud of them——all of the things you listed are still a perpetual source of shock and confusion for me. I think that’s part of the angst! There’s a huge gap between what my life looks like and what I *thought* my life would look like, and I’d be lying if I didn’t say that I wanted both. It’s hard to articulate! I’m not beating myself up here, though. I’m just reminding myself that I have goals beyond what I’m doing right now, and I don’t want to forget them because what I’m doing now is more convenient or easier or higher-paying or whatever. ANYWAY, thank you, though. I really do appreciate your kindness! Got it. Goals are good. A fun exercise: ask a lot of old(er) people, like me, to compare their lives to what they *thought* they’d be. Not one I know bears much resemblance to those ideas, but on balance, much of what is turns out to be more rewarding than what we imagined. Still, the adage is true: it is the things not done that one regrets. I love reading your blog for many reasons. One being what you write about and two being the way you write. Congrats on being printed! Yes! That first paragraph is my internal dialogue every day. Congratulations and don’t ever doubt your way with words, it’s obvious you have quite the talent. You are a wonderful writer! I look forward to every new post. You have brains, energy, and vision and you seem to put all that to good use. Keep on keepin on because you have a whole lot of people inspired by what you do. I am sure this magazine piece will be the first of many. So funny , It’s always the most talented people who doubt themselves the most! Although I’m sure you have an itch to write and see it printed on paper or in a tangible object, I read your blog much more than I read the newspaper or magazines right now! I absolutely love your writing style and off the wall humor. It makes your reader feel like we are old friends sitting in the middle of a room project together drinking wine and discussing house things. I say don’t be too hard on yourself for not doing more about pushing your writing or doing specific projects. What you do with your blog is huge and you reach so many of us as with it. Not to mention the itch I get to go out and buy an old house and tear into it! It’s not really the printed/tangible object thing so much as the type/format/tone of writing thing. As much as I love writing this blog and do put a good deal of effort into making the posts fun/entertaining/informative/etc, it’s a totallllly different thing than writing an actual essay——which is much more what this piece is. There’s a certain format and level of formality that seems appropriate to blogging (not to mention subject matter being pretty much entirely home renovation! ), and this blog has just never really felt like the right forum to be publishing pieces that don’t jive with that. Daniel you could write about dirty underwear (eew) and still make it fun to read!! Now don’t forget I set first dibs on being your overseas agent on your first book. Your problem is that you are passionate about and good at everything you do (yes you are) so of course it’s hard to find your ‘right life’. I wish you well in whatever you do just don’t stop writing this blog please! But back to the magazine piece, megacongratulations! BUT… what about us foreigners? How can we read this article? Could you perchance reproduce it here on your blog for us? Thank you, Luna! Somehow I’m guessing that reproducing the whole thing online would be a massive no-no, but I’ll see if there’s anything I can do for ya. Anthology is pretty pointedly a PRINTED publication, so aside from the short preview on the site, I don’t think it ever becomes digital. It looks like Anthropologie does ship internationally, though I understand that shipping/taxes might make the price just a *tad* silly for a magazine. Hmmm. As I’m headed on a trip to Baltimore Friday I’ve already asked the store that carries the publication there to save me a copy, which they are. It’s so interesting that the seller locations in my home state are completely out of my orbit but the shop in Baltimore is mere blocks from my destination. Otherwise I guess I would just drive the 60-80 miles round trip to pick it up. Well, so in the story published in Anthology, Daniel introduces us to Old Mike, the tape man (and previous owner), and adds even more descriptives to the sorry state of the house at the point he and Max took ownership. More, more, we want more! I just read this article last night (the magazine has been sitting by my bed for over a week, it’s just taken me a while to get to it), and was coming on here to chide you about not mentioning it! It’s a great article, really well written. Congrats! 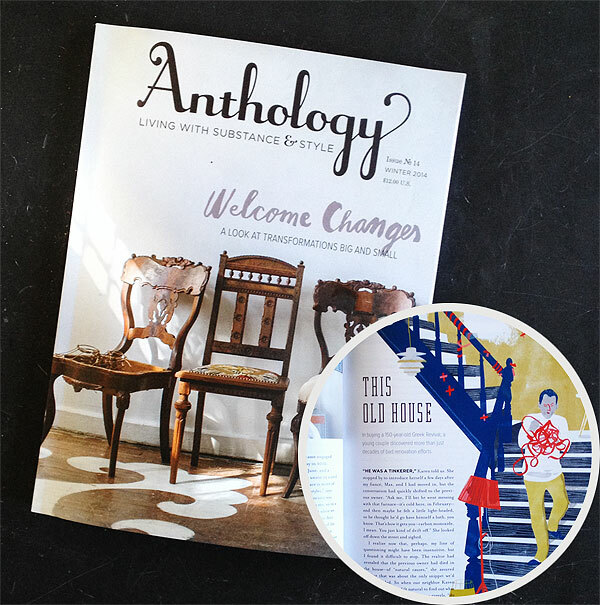 Anthology is my favorite – they always feature such interesting and talented people, yourself included. Congrats! I love your writing, and the fact that you take the time to write long, detailed, funny posts instead of quick daily stuff. Let me just say that as a 46 year old woman those feelings you speak of, never leave you. A person should always have goals, no matter how large or small. However, I am learning to stay in the present as that is where fulfillment comes from. Looking to the future can often times bring anxiety. Ruminating on the past can also bring on anxiety. Staying in the present is where fulfillment comes from. Yes Yes Yes! Been waiting for this to happen since the first post of yours I read: “The Desk with a View” 4 years ago. Glad you went on for a bit and you are as long on words as you are in pictures in your posts. It’s what makes your blog special. Excellent! Will pick one up this weekend. I was always jealous of those people who knew what their life was supposed to look like. Sure, I had goals and aspirations, but I never was good at fitting it into a box. As I grew older, I became more glad about that, less and less jealous. Just like 15 years ago, no average person could predict or foresee they’d have a tiny computer in their hands all day every day, I could never have predicted – and quite frankly directed – my life where it is now. Did I miss some roads? Likely. But if I would have taken them, I never would have gotten here. As long as you are heading in the general direction, are happy with the progress, it really does come down to the journey over the destination. That’s probably a lot to ask of a 20-something. So Shoot for the stars! You’ll find what you’re looking for over and over and over along the way. Promise. But with all that said (it was longer than I intended) would you share some of the other goals you have, or is that too personal for the blog? I enjoy hearing what’s going on in your head, and I bet your other readers do to. It’s not too personal, but I really don’t know! I don’t think I have too many super concrete goals, honestly, at least professionally speaking (maybe that’s part of the problem!). I would like to write professionally, but that always feels sort of silly to say because I guess I’m not sure exactly WHAT I’d like to write professionally. Most of the writing that I really love and look up to isn’t really the type of writing that’s published anymore, unless you’re like super duper famous and can get away with it. So. There’s that. I’m not sure what else to say! I’m really not someone with a detailed “life list” and stuff. I guess I just want to be able to support myself and my family and do work that I find fulfilling and feel connected to whatever community I’m living in and be a decent person. I understand what you’re saying Daniel. Sometimes you have to keep your hopes and fears to yourself, in order to still feel like a complete person. I am very private myself, and I don’t feel the need to tell anyone about what’s going on with my inner life. It’s great that you write your blog; it’s courageous that you allowed yourself to be published in the magazine; I think all you need to do now – I mean whenever you’re ready – is write a novel. I have a feeling that would be very satisfying for you to do. Congratulations! Anthology is one of my favorite publications. I look forward to reading your two cents worth. Congratulations, Daniel! From one creative writing major and perhaps overly lazy writer to another, I understand how easy it is for longer-format writing projects to get continually swept aside in favor of the urgent NOW, and know that dull, nagging feeling that you might be letting yourself down by shelving a talent you believe in. I, too, grabbed myself by the lapels and sat myself down and wrote a thing a while back, and was so delighted to have it published that I thought the delight and the success and the whopping $100 check would somehow magically propel me forth on the crest of a great wave of creative focus and achievement, and, erm, well… Apparently you have to keep at it. Who knew? So keep at it, and may that gorgeous new office be the perfect creative haven! Can’t wait to get a copy! This is really exciting, Daniel! I’m currently in the beginning stages of revisiting my goals too. I’m hopefully to have some finished products soon to help get me to that elusive Point B.
I’m an Anthology subscriber, but I’ve only just started reading the latest issue. Since they are only quarterly, I try not to rush through the issue when it arrives. Now of course I have to get to your article. I feel like I have access to exclusive content! Congrats! I don’t recall how I stumbled upon your blog, but I love your writing style (and have endured a few pangs of regret that I left my life in NYC when reading of your DIY adventures) and read all your archives. *ahem*. And you have me *this* close to making a few of my own cosmetic changes to my apartment here in L.A. You’ve certainly inspired me to get rid of the lived in Bachelor vibe anyway. Great job and well done! Oh! And I understand that feeling of knowing you want more (and may be capable of more) but still getting sidetracked, umm, life. Welcome to life!! Keep on and keep it real. Just ordered a copy in France. Can’t wait to receive it. My husband and I are great fans of your blog. Congratulations! Congrats Daniel! I actually wish I could read more of you: you’re always a beam of sunshine in my day when I found out something new has been published on the Manhattan nest! No seriously, you’re my favorite blog. Keep up the good work. Yeah, I was reading that essay when I received my Anthology mag…. got about halfway thru and was all “wait a minute….. this sounds like that house that guy bought whose blog I like…!” and skipped to the name and saw it was you! Congratulations! That’s a great mag and your essay was so good!! on another note, I love your writing, and am so happy to hear you’re sharing your skills. I totally get the “I don’t want to share my writing” thing. It’s a very personal thing, even if it’s about diying a table or some such subject. Judgey von Judge-judges are everywhere. I must admit that I just now found your blog as a result of the Homies Award on Apartment Therapy. Congrats on the inclusion in Anthology and for being a finalist for the Homies Award. Your wit and style are refreshing! I read tons of home blogs because the people are creative, the pictures are beautiful, the houses are amazing, and I get really great ideas I can apply to my own home. But I don’t read most of those blogs because the writing is great (or even good, really). Your blog has all of those great attributes, but you could have absolutely no pictures of the work you are doing and I would still read every word because you can write, my friend. Mazels! Great job! I only wish I could read it, but I don’t have access to the magazine. I do love your writing style on the blog though, it is very personable and fun! O Daniel; I can’t believe you are not going to tell us about the ghost in your house on your blog! I am waiting for that story. Really. But congratulations anyway. You deserve it. The best way to get somewhere is to start, anywhere. It does not matter where. When you are ready it will come. I just saw a woman from Amsterdam (about my generation I think) stand on the Oscar podium (in Prada, hahaha) with Brad Pitt and Benedict Cumberbatch, and Lupita behind her husband, while he was handed an Oscar and rambling on his acceptance speach. Anything can happen. I love the way you write here, and I’m really excited to read something you’ve published professionally. I’m also super happy for you, that you’ve got the opportunity to branch out and do more with your writing, and that you’re taking that chance. GO YOU! Daniel, I have been reading your blog from the beginning and I realized right away, here we have a writer, a very good writer. I know quite a few good writers, published writers, and I have mentioned your blog as an example of a young, up and coming writer. The writers I know try to write every day – yes, every day. Most keep journals. They also network with other writers and everyone critiques everyone’s work – it is just part of the process. At the end of the day, I think someone either has it or they don’t. You have it. I am not a good writer, but I am a excellent READER. The writers I know are all READERS. Many people think they can write, in reality, very few really can, but you can – I can’t wait to see what you do, I feel you will go far. I have never said that to a blogger in my life! Keep it up, read, write, network…some day, a book. Good Luck, Daniel! Congratulations on your publication! I studied writing in college too. I always thought I’d grow up to be a “writer” but never could figure out what that looked like in practice. So I just bumbled along through my 20s — writing for a newspaper for awhile (fun! but minimum wage), then writing marketing copy (fun! but not very fulfilling), then writing training materials (not fun! but good practice). Despite the glut of English majors out there, I’ve never had trouble finding a job because it turns out being able to write well is truly a rare and valuable skill. (It helps that I’ve never minded taking on less creative writing assignments, because it is good practice and I enjoy playing with words regardless.) At your age I had no idea where my career would take me (and perhaps still don’t), but I just got back a few days ago from a two-week work trip to the Congo, where I was feverishly collecting notes and stories about women who have survived unfathomable sexual violence. I’m so happy I now have a job that allows me to write about things that matter to me, and I feel honored that I can help these women tell their stories. I’m not a famous novelist and most of what I publish is under someone else’s name, but the writing I’m doing now feels right and genuine. It’s what I’m supposed to be writing right now. Uncertainty about your career path may flare up every now and again, but my advice is to simply keep reading and writing. You’ll figure it out as you go. You’re already succeeding! There is something wonderful and challenging about writing in different styles/tones/formats. I feel the same way about my academic writing compared with my fiction writing and (fledgling) blogging. So, congratulations on challenging yourself and then meeting that challenge. The next time I share your blog with my multimedia writing classes as a success story I’ll include this post. It would never occur to me to buy anything at Anthropologie – nothing against the place, it’s just totally out of my orbit – but as soon as I saw your post I rushed out and ordered a copy online! That’s how much I love your writing and how eager I am to read an essay by you. So thanks! How exciting. Congratulations!! Can’t wait to get my issue and read it. I found your blog because I loved the essay you wrote in Anthology. Happy to have found you and your good words. You are a renaissance mensch. I just saw your kitchen is featured on Lonny’s website! I feel like such a fangirl for being excited about that. Congrats! Congratulations Daniel! I’m 35 and feel pretty much exactly the same way about how to go about writing in my life, what avenues to take toward publishing, how to figure out pieces and where they should go. Frankly, how to sit down regularly and write (I hear blogs are good practice for that). I give you lots of credit for figuring some of that out and doing the work and getting your thoughts printed on paper where lots of people will read them! I love your voice on this blog; I do carpentry, plus am obsessed with old things and never hiring people to do things for me, so those elements attracted me to Manhattan Nest. But what keeps me coming back is you, your wit and wording and style. Good luck sleuthing out tangible, realistic writing goals in this fast-changing world and finding ways to incorporate those goals into your life. Well done! Congratulations Daniel. Your writing is very honest and free-flowing. Have you graduated from NYU? i practically sprinted over to anthropologie to buy the magazine, and i LOVED your article! great work, you! Great stuff! Congrats on getting published! I finally got around to reading my copy today and I had to write you a note. I know that this post is a bit old and you’ve probably moved on, but your piece was actually really wonderful and a little bit poetic. Just wanted you to know that I liked it very much. I hope you keep finding forums to show off your work. I went and bought Anthology tonight just so I could read your piece. I literally laughed out loud! It was beautiful, funny, and reflective. I just started reading your blog. Your voice and writing style keep me entertained and inspired! Keep it up! ← How To Build A Simple Floating Desktop + Shelves!